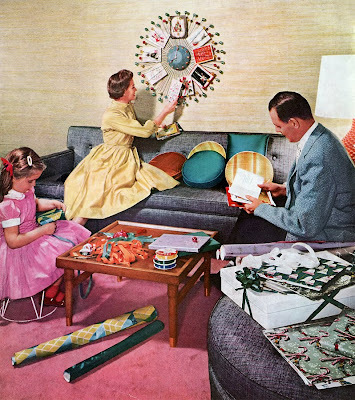 Happy holidays from Mad for Mid-Century. If you're looking for a place for all those last minute holiday cards you're getting, follow the photo above and slide them between the prongs of your starburst clock. 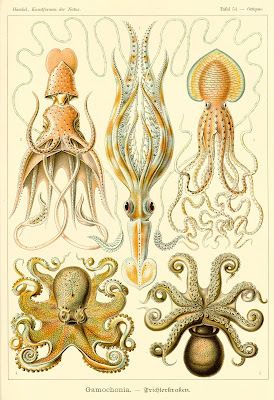 The octopus is my favorite animal. I think it's a odd and gorgeous creature. 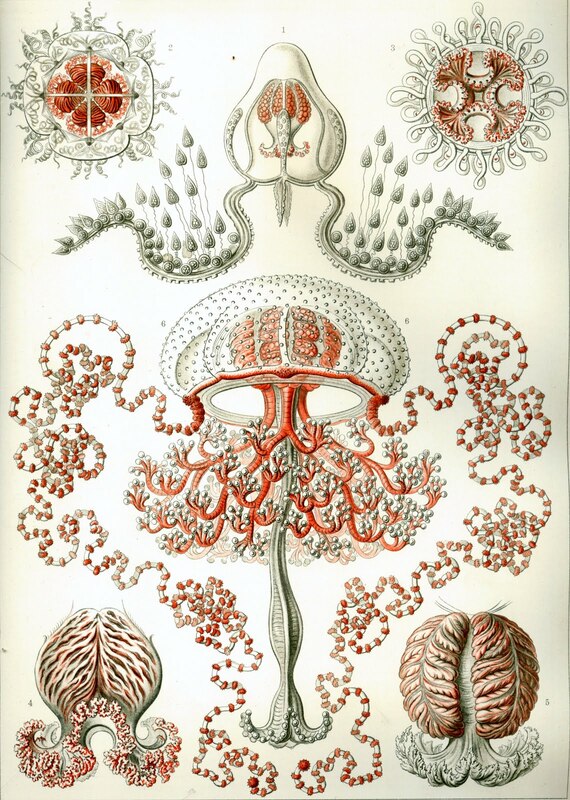 There's alway been one image of an octopus that I especially loved, but I was never able to find the source (bottom left). But now I know it comes from Kunstformen der Natur or Art Forms of Nature by Ernst Haeckel. 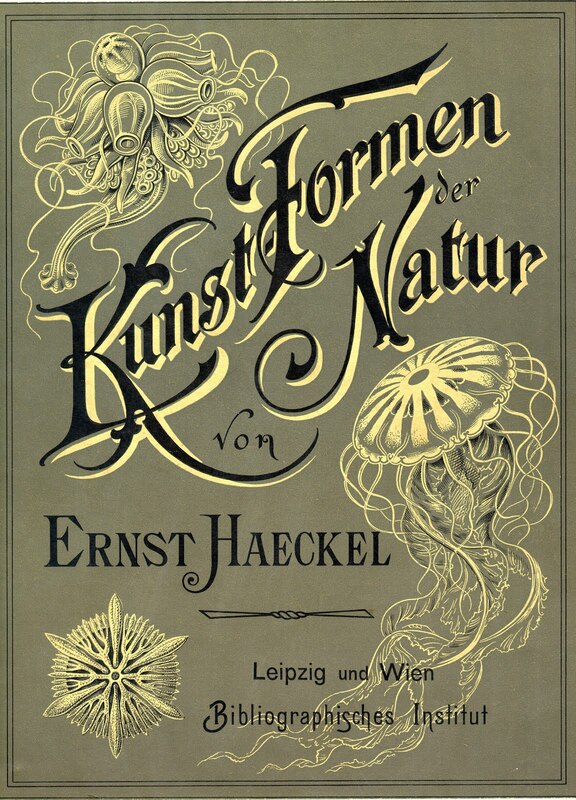 Ernst Haeckel isn't exactly a mid-century artist, in fact much of his work isn't even from the same century as mid-century art — Art Forms of Nature was first published in 1899. Besides me finally finding the image of the octopus I've been looking for, I found a book full of gorgeous illustrations of nature. 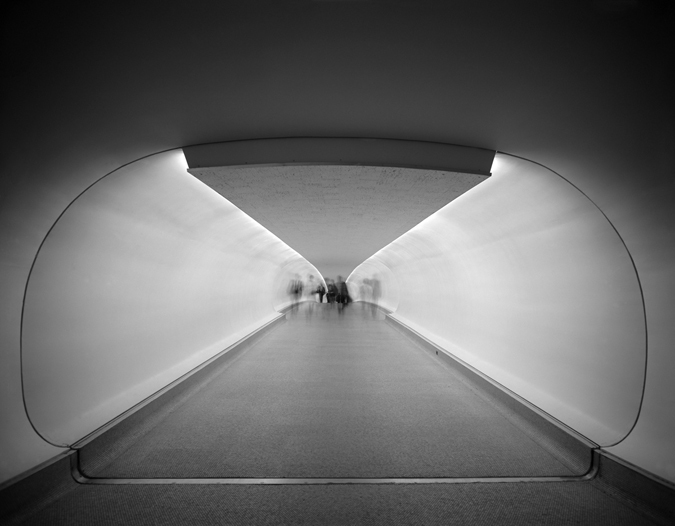 I mention the book and the images with here because I think they would look outstanding on the wall of any mid-century or mid-century modern home. I love when art plays against the look of a room. 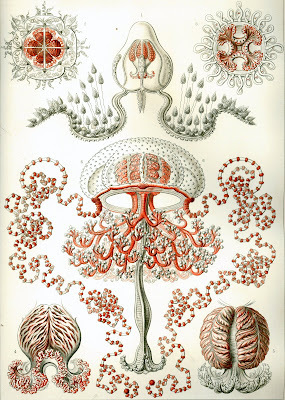 The elaborate illustrations and lines of Haeckel's work would play lovingly against the streamlined look and straight lines of mid-century modern furniture. 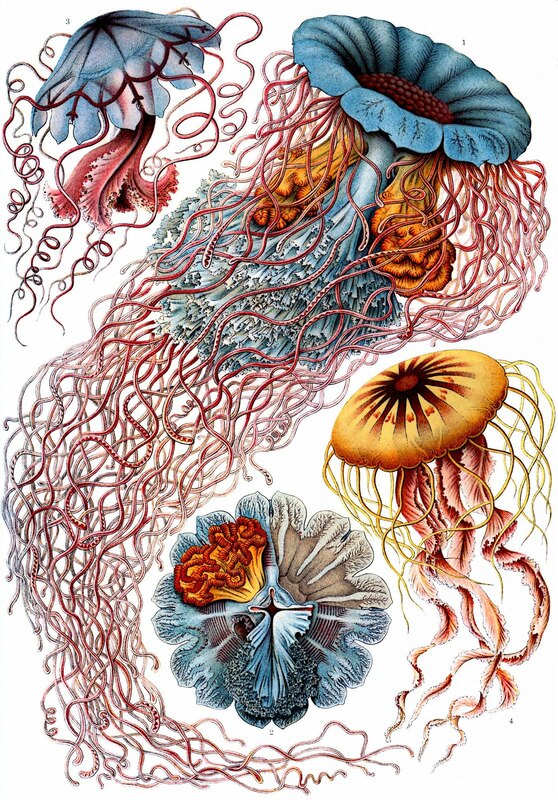 The best part of it is that the images in Art Forms of Nature are now public domain, so if you can find a high enough resolution image, you're free to print it and hang it on your wall. 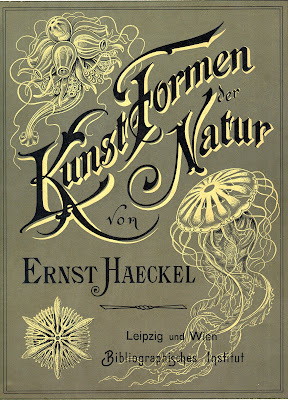 You can see all the images from Kunstformen der Natur here and you can buy them in book form here. 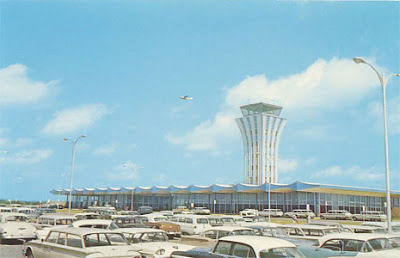 I've talked about mid-century airport architecture before, but Flavorwire has a much more extensive look at a time when going to the airport mean you were probably a part of the jet set. Looks like something more out of 2001 than the mid-century. Then you should read this article. And then you should check out Danny Heller's work. It's not so much mid-century art in that it was painted in the mid-century, but that the subject matter is mid-century homes and lifestyles. It could be a little odd to have mid-century art of a mid-century home in a mid-century home, but I think if put in the right spot, it could really work. Mid Century Mobler is a vintage furniture store in San Francisco specializing in Danish and American mid-century modern furniture. Well, a store that currently runs out of shipping containers to keep costs (and prices) down, which also adds an air of chic and exclusivity to the situation, like that secret bar that doesn't have a sign. 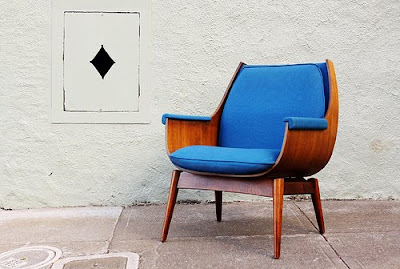 This time on Vintage Views, we talk to Julian Goldklang, owner of Mid Century Mobler. Tell us a little bit about Mid Century Mobler. 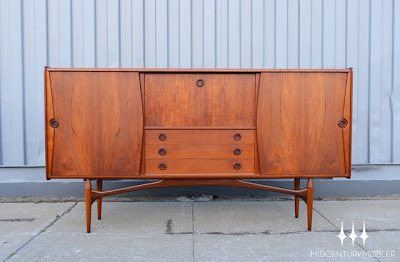 How did you get started selling mid-century furniture? I’ve always been attracted to design from the late 1950’s / early 1960’s. 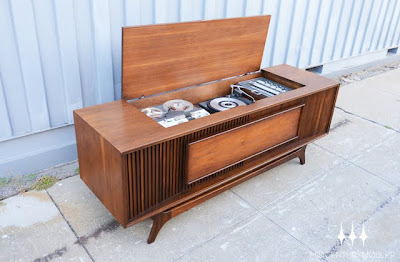 Since estate and garage sales are some of the best places to find pieces of that era, I used to spend every free Friday and Saturday I had hitting places that promised anything from the atomic age. If there weren’t any sales going on that day, or I’d been to all of them already, I’d start driving around the nearest Eichler neighborhood (we have a few of here in the Bay Area), which were all built in the early 1960s. One Saturday morning, I came across a sale offering a complete, mint condition Broyhill Brasilia bedroom set with the original tags, a Lane living room set, and a couple other random pieces all for $100. I didn’t need any of it, but couldn’t pass up a deal that good. I brought it all home, piled it up in my dining room and started selling it on Craigslist. That really gave me the bug and I spent every free minute I had looking for new pieces to buy at garage sales, flea markets and online. Eventually, I had furniture stacked to the ceiling of my one-bedroom San Francisco apartment, which is when my roommate kindly suggested that he was going to murder me if I kept using the dining room as a storage unit. Where do you find your pieces? Rumor has it you do some importing from overseas. I travel to England and Denmark about every two months to put together a container to ship back to San Francisco. Pieces are found all over the country. I spend about two to three weeks traveling around to estates, flea markets and various sales to acquire unique pieces to ship back. It’s time consuming and a bit of a logistical nightmare to coordinate shipping all that stuff to a central location for packing when you’re overseas, but it’s well worth it when the container arrives back in the States. You started selling out of a garage in San Francisco. Are you still selling out of the garage? I did! After moving everything out of my apartment, I found a one-car garage in the middle of the city that served as Mid Century Mobler’s headquarters for about a year and a half. Other than the fact it leaked like crazy whenever it rained, or when the upstairs neighbors over watered their plants, it worked out really well, and was a great place to launch the business from. I’m a proponent of keeping a low overhead when starting a new venture, and a leaky one-car garage was about as inexpensive as you could get. After a while, we were selling more furniture than we had available, so I had to find a way to get a larger inventory. 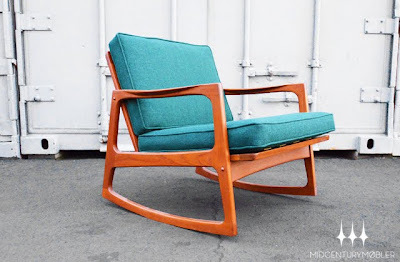 I figured since the few Danish modern pieces I was finding locally were probably more available in Denmark, it only seemed like the next logical step to start shipping from overseas. Right before the first container arrived, I realized there simply wasn’t enough space to keep everything, so I moved the business to the outskirts of the city, where I currently keep everything in a couple of 40 foot storage containers. Right now, I’m looking into moving everything into a 5000 square foot warehouse to make it easier for people to browse when they come by, and so we have a little easier access to everything. You're one of the few vintage stores I know whose main avenue of selling is online. Why did you decide to focus online? At first, it made the most sense to sell exclusively online to keep costs down, but as time went on, I realized that the majority of people these days do most of their shopping (including furniture shopping) online. Another factor that contributed to selling only online is that retail space is at a premium here in San Francisco. When I started looking around for a space that could work as a showroom, the prices on rent were so insanely high that it wasn’t even a possibility to get a retail space. At $3 to $4 a square foot, getting a 5000 square foot warehouse would have cost around $17,000 a month! By building out our online presence, we’ve been able to not worry about the financial overhead of a brick and mortar storefront, which I’m able to pass on to our customers by keeping our prices lower than a lot of traditional retailers. You seem to have a particular love for Danish furniture. Any specific reason? I feel like the Danish aesthetic is one that’s unmatched by the design and construction of pieces from any other country. Design runs in their blood and it’s something that can be realized when looking at their furniture, architecture or even their city planning. Everything is always very well thought out and well executed, and it’s easy to appreciate when you experience it in any form. It also looks really cool. 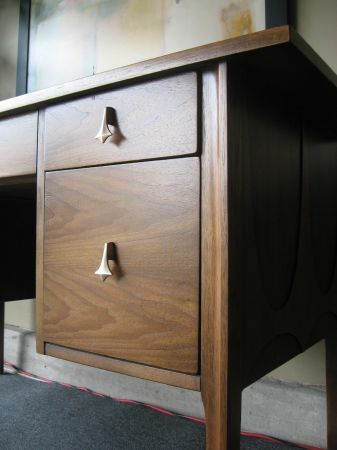 Do you have a most-requested type of furniture — either a specific line, type of wood or piece (desk, dresser etc)? The line of furniture we get the most requests for is probably the Brasilia collection by Broyhill. I’m not sure if that’s because it’s the first picture you see when you go to our website or if it’s just because its growing popularity. Personally, I’m a huge fan of that line, so I love when we’re able to carry those pieces. The most requested type of furniture we get is for pairs of nightstands in teak or walnut. Pairs are tough to come by since they are frequently broken up over the course of their life. How often do you get in new pieces? I’m always looking for and finding new inventory locally, since all the American designed and manufactured pieces from the 1960s are still here in the US. I find they’re a nice supplement to the Danish and English designs. On average, I probably get in at least three to five new pieces a week locally, and about 200 to 300 new pieces when containers come in every other month. What's your favorite piece to come through Mid Century Mobler? One of my favorite pieces that came through the shop was this bent ply and walnut lounge chair covered in cobalt wool. It was probably designed and manufactured in California in the 1960s, but there were no definite markings anywhere on it. The whole seat was made to look like it was floating off the base, and the entire back was upholstered in the same blue wool. You could spot it from a mile away; it was very visually striking. I haven’t found another one since we sold it, and I get people asking about it (from a picture in our sold section) every other week or so. 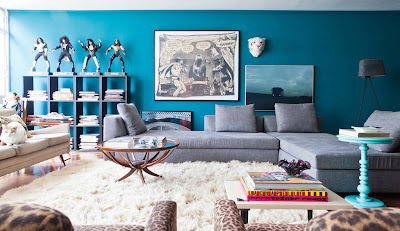 And what's your favorite piece in your personal collection/your home? 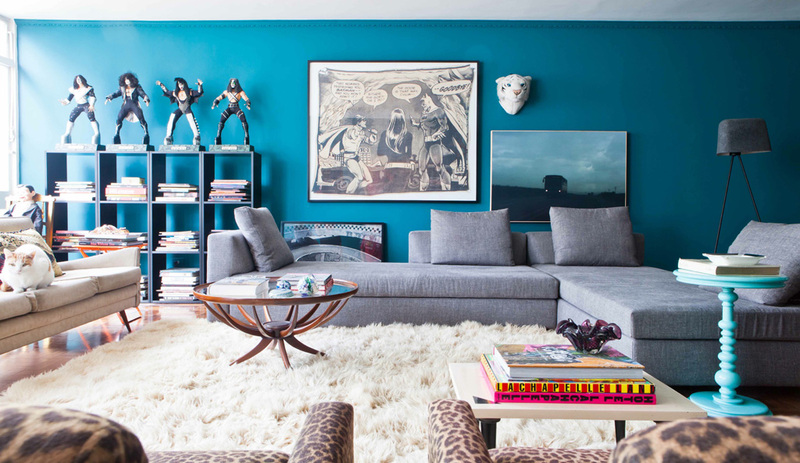 My favorite piece in my collection is my Adrian Pearsall for Craft Associates couch. I found it at a flea market about two years ago for a song and couldn’t believe how well it was kept. It looked like someone bought it brand new in 1960, wrapped in plastic and stuck in the never-used guest room of a house that was hermetically sealed for 50 years. It’s still got the original wacky floral back cushions and red wool upholstery on it, along with the original Craft Associates tags. Mid Century Mobler wants to offer readers of my little mid-century blog a 15% discount on all online orders. 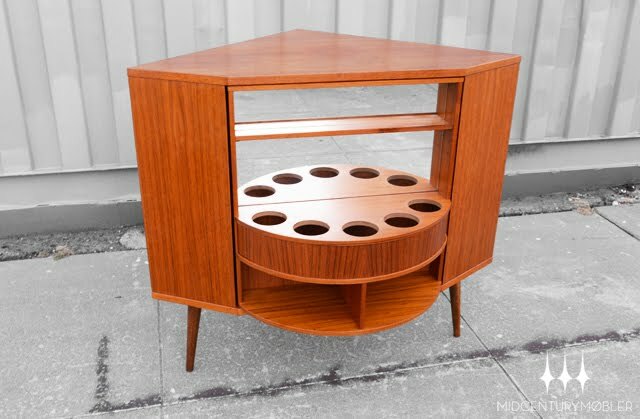 Shop at MidCenturyMobler.com and get 15% off all items using the discount code MFMC15. 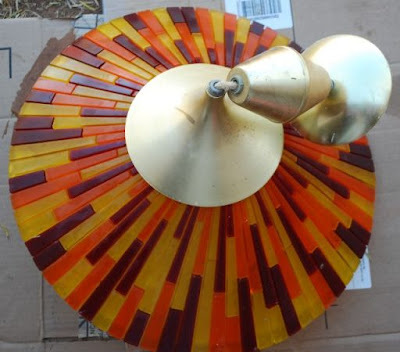 Rejuvenation has a great blog post about mid-century pendant lights, or mid-century modified lights as Rejuvenation calls them because they focused on lights that were made in the '60s and don't have what some people would consider true mid-century modern esthetics. 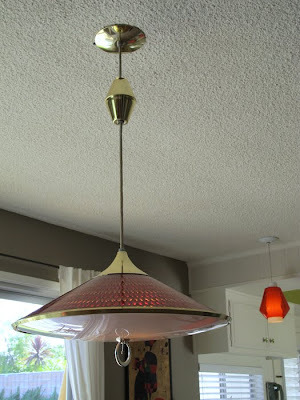 Everyone should check out the post and not just because my current mid-century lighting obsession, the Moe Light orange honeycomb pendant, makes an appearance. There's some pretty good eye candy to scroll through and one or two lights that are, let's say, interesting. 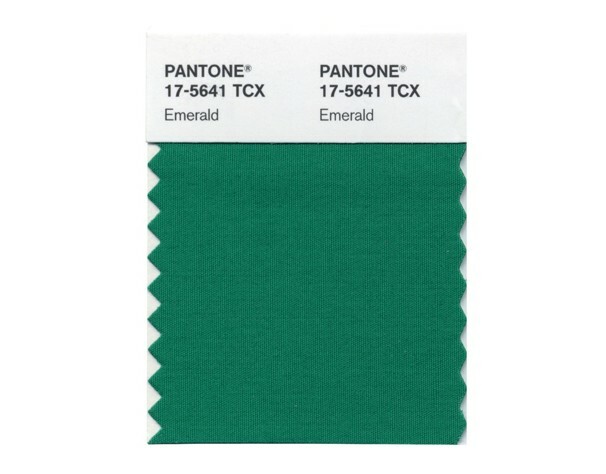 Pantone released its color of the year for 2013 and it's Emerald Green. I've been a fan of emerald green for a long while, but I didn't think it'd be the color of the year. My money was on a lime green. 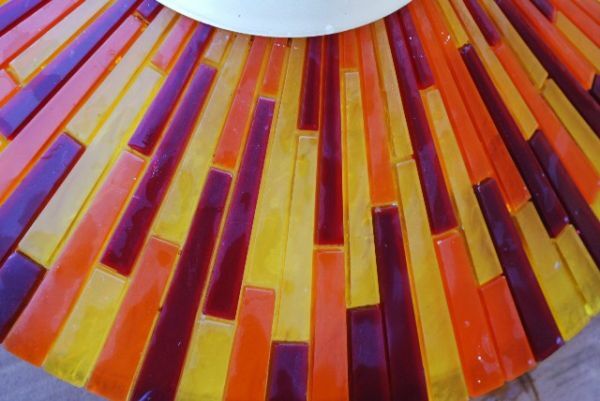 Or a mustard yellow ('70s style) or a bright orange. Something that was more of a classic, "coming out of a recession/depression color." Or a bright '80s neon color muted a shade or two. That said, Pantone is usually a shade or three darker than I expect. 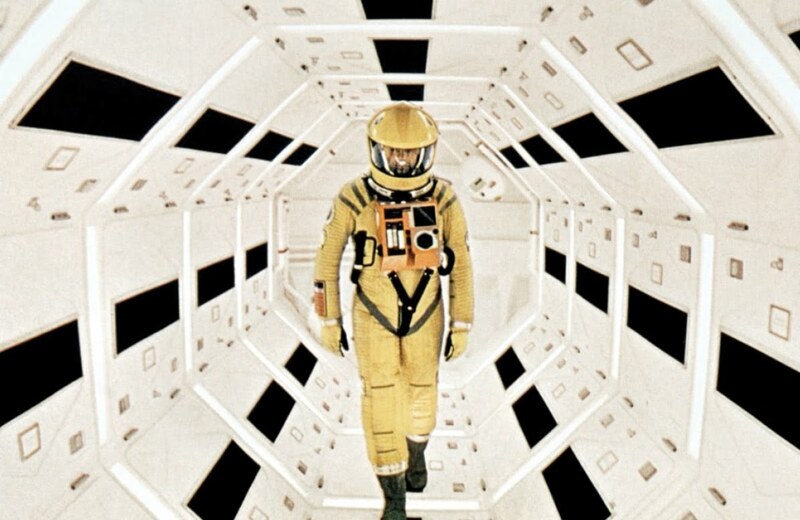 If nothing else, I'll have something to debate with with my creative graphic designer wife for the next month or so. 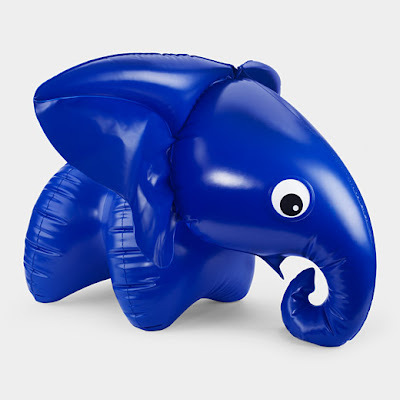 One of my New York friends emailed me and said, "Hey, I saw these cool inflatable animals at the MoMA store. You should get them for your travel nursery." My initial thought was, "How cool could these animals be?" 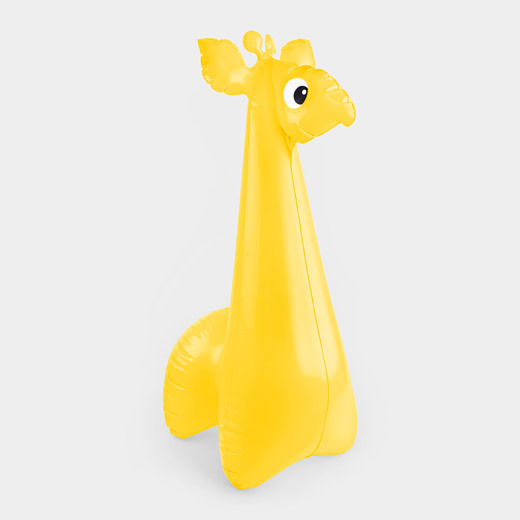 Turns out, really cool because they're reissued Libuse Niklova inflatable animals. As part of the Century of the Child exhibit the Museum of Modern Art re-issued the inflatable toys using the original machinery. And my friend was right, they would fit pretty well in any mid-century modern travel-themed nursery. Libuše Niklov á designed inflatable armchairs for children, which she later modified into whistling animal shapes. This transformation turned them into both toy and seat at the same time. They were so innovative that their production process was patented, and these re-editions are created using original machinery. Ages 2 to 4. 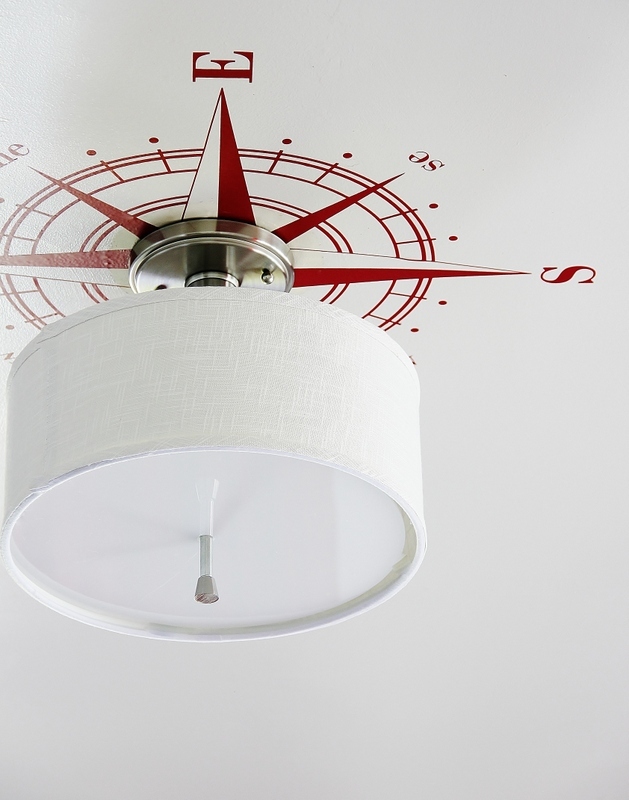 We love this airplane ceiling light, which hangs in our travel-themed nursery. But if we didn't have it I might be persuaded to pull out the paint and get to work on a compass ceiling medallion. 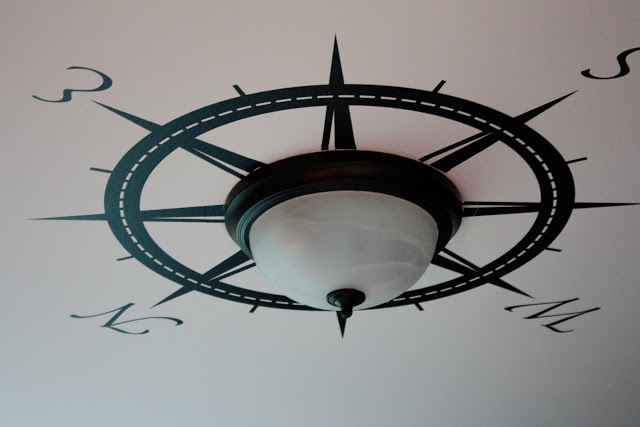 If you're building a travel-themed nursery, a compass ceiling medallion with be the perfect way to spruce up the ceiling without going overboard. A couple of interesting items came up on Austin's craigslist over the weekend. 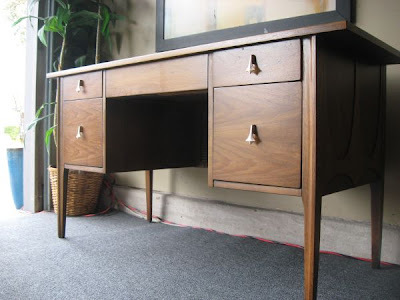 First up, there's a Broyhill Brasilia desk for sale here. 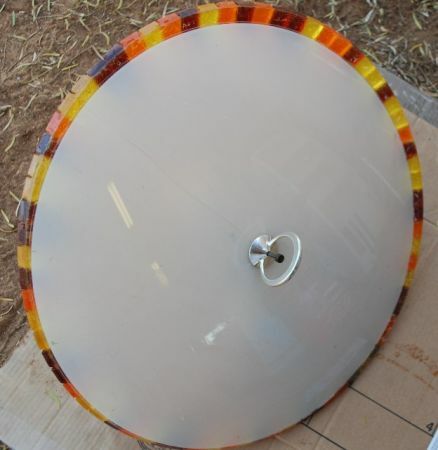 And an orange Moe Light Fiesta pendant light for sale here. I'd love to have both in our home, but we just don't have the space. Maybe you do. We recently had to pick up some kid band-aids. We've been using boring adult ones and the little one didn't really care. But now it's time to add some fun to boo-boos. 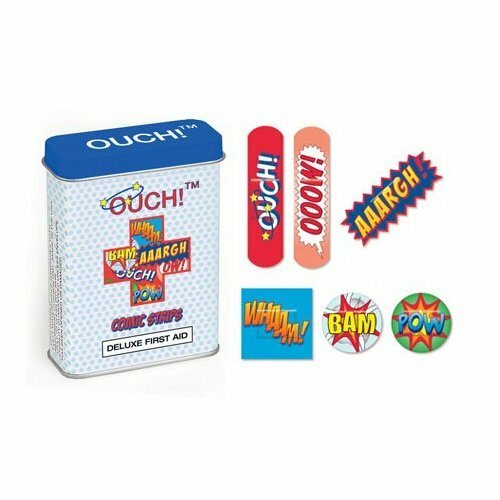 But the kid band-aids in the store were ugly and/or boring (or covered with TV characters I don't want the kid to know about yet). So I went online and found some better ones. These super hero band-aids will soon the official band-aid of our home. 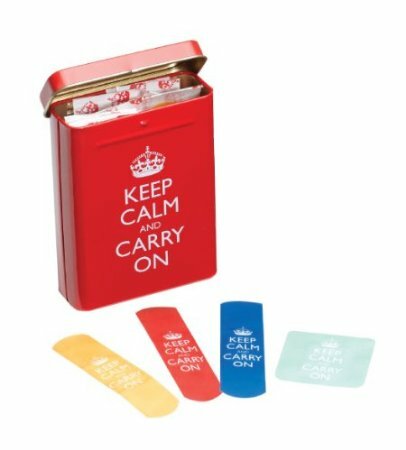 However, I'm going to pick up some of these Keep Calm band-aids too because the Keep Calm and Carry On band-aid tin will be the official band-aid tin of our house (and I get boo-boos too sometimes). We have Netflix and no cable, so we watch TV shows seasons at a time. 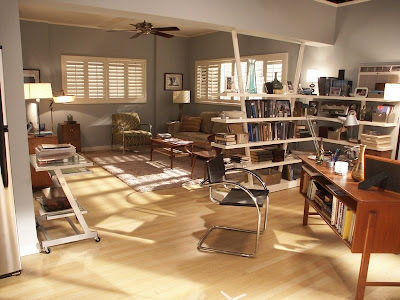 We just burned through three seasons of Dexter in about a month and I am now mildly obsessed with his apartment. You can see why I love the interior here and why I love the exterior here. I think my favorite part is his bookshelf. Although, I didn't notice till today that it mirrors the support beams of the exterior — which makes me love it even more. 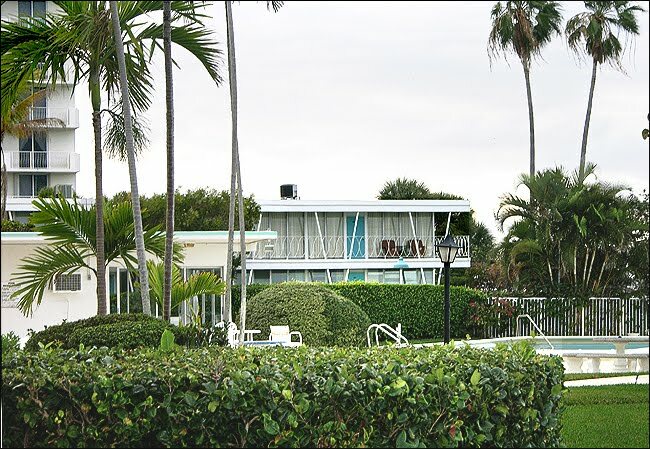 If you ask me, this would definitely be a mid-century building in Miami worth saving. I've got some schemes on how to integrate my mid-century modern art toys into my home. But I might steal some design tips and ideas from São Paulo. 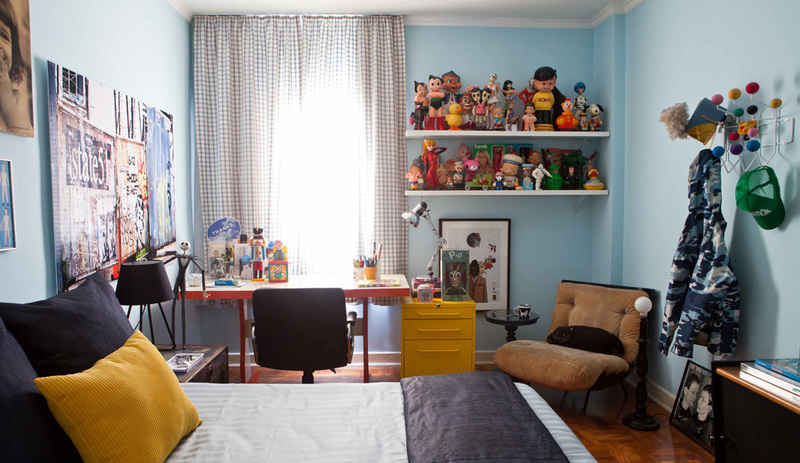 They have more than a few mid-century modern home clients with art toys and it's great to see the collections live throughout the house. 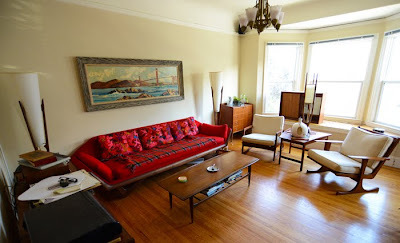 Is Mid-Century Old Enough to Be Historic? We're coming to an interesting intersection in American preservation. 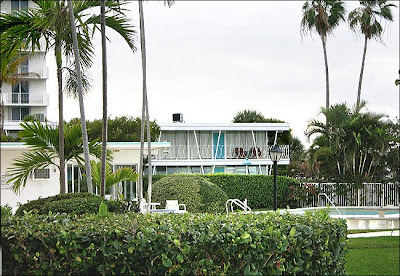 The point where we have to ask, "Are mid-century homes and buildings historic?" And, "If so, what are the defining characteristics?" I've touched on the subject once or twice, but I'm just a fan of mid-century and good architecture. I don't want to even start suggesting I have the answers — or expertise that would qualify me to give the answers. But NPR started asking some interesting questions in a story I heard the other day. 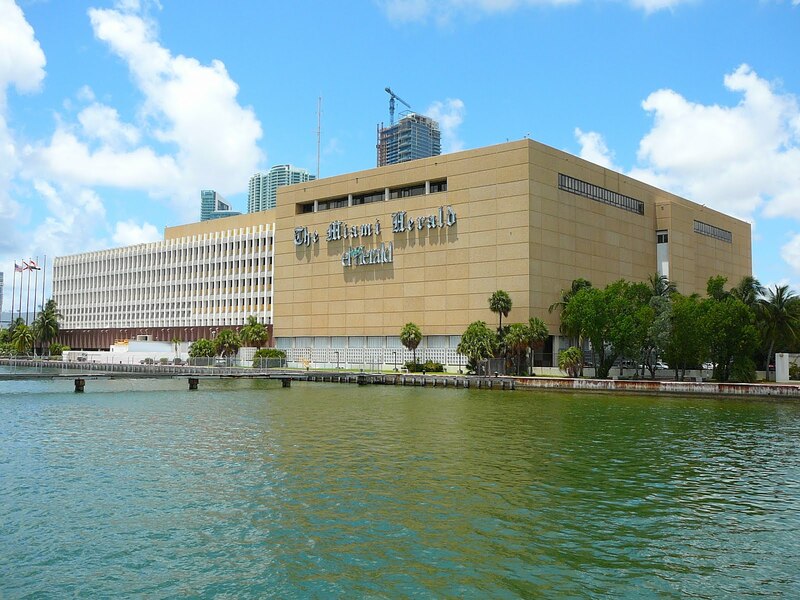 The Miami Herald's old headquarters on Biscayne Bay have been sold to a developer who wants to tear it down. Historic preservationists are working to stop the demolition, saying the hulking, boxy building is a prime example of Miami modernism architecture from the 50's and 60's. Demolition proponents — which include some prominent architects — say it's a clumsy building with no sense of style and not a "MiMo" design worth saving. Is it NIMBYism or mid-century preservation? For a while, it might be hard to tell. Our library could probably stand a little love and a new paint job, but at its core it is a pretty outstanding mid-century building. And I finally got around to taking a few photos during our weekly visit. It's the Yarborourgh library in Austin now, but that wasn't the case till 1999. Originally the building was the Americana Theatre (hence the double sign), a movie theater that was built in 1965 and sat 1,000 people. Story goes that the theater, which had been sold to AMC Theaters by this point, had a contract with Disney for the exclusive rights to premier Annie, but only if they continued to show it for 18 weeks. The extended showing essentially bankrupt the theater and that's how it became a library. 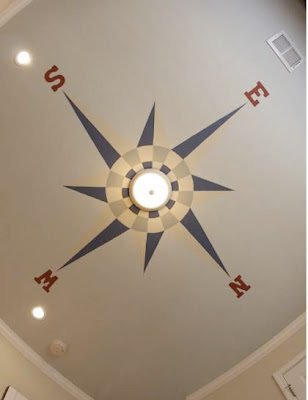 If you pay close attention to Dazed and Confused you might reconize the Yarborough library. It was the parking lot where the cheerleaders hazed the freshman girls. The columns are reminiscent of hair pin legs, with some atomic-style connectors and caps. The overhangs have been redone, but they kept the orignial wave motif. You can check out the original overhangs here. 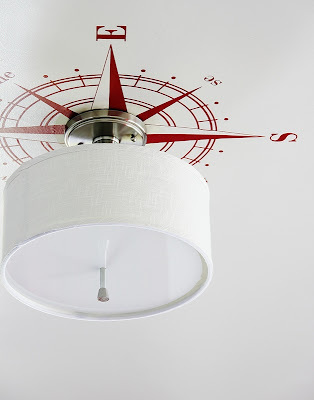 The pendant lights under the overhang have an extremely mid-century modern / atomic age feel to them. I'm really glad this building has been repurposed and will probably be around for a while, and that I get to visit it every week. I have a mini obsession with VW buses. Once we're to a stage where we're no longer hauling precious cargo around (the type that needs a baby seat and/or airbags), and my current car turns its last key, I'm planning/hoping/scheming to get an old-school VW camper bus. However this VW bus wagon, which we spotted at the park, would be perfect for kids. I asked the dad attached to the handle about it and it turns out he took a fire truck wagon, stripped it down, repainted it and added a few VW touches. That's a lot of work for a wagon, but it is one kickin' VW bus wagon. The 2012 Blue Genie Art Bazaar opens today and runs till Dec. 24th. 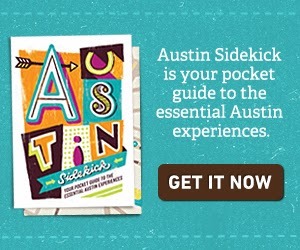 If you're in Austin, it's a great place to pick up some art for your mid-century home. Some of my favorite local artists show there year after year and I almost always find one or two more to fall in love with. And it's usually a pretty good place to do some holiday shopping. 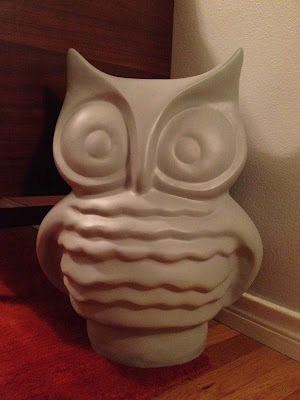 I picked up this gray owl from Blue Genie themselves at the Bazaar a while back. It lives in our play room, right next to our rosewood buffet, and we love it. We bought it a few years before owls got big (ridiculously big); so it looks a little trendy these days, but also has a timeless quality. And it will be living in that spot long past the owl trend.